Animals Unknown, What Kind of Animal is this? Mystery Solved! 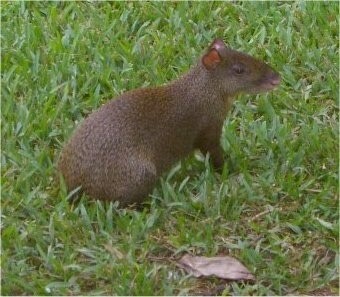 The unknown rodent is an agouti. Thank you DeAnna. 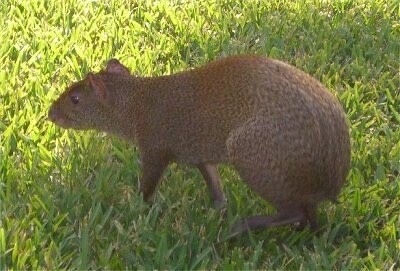 This large rodent was spotted in Mexico. Someone emailed in suggesting this was a Squrat (half squirrel/half rat), however I was unable to find another picture of a squrat online to compare it with besides stuffed toys from the movie Ice Age. Squirrels and rats both have tails and the creature above does not have a tail. This creature almost looks like a cross between a squirrel and a guinea pig, however I believe this is a real species of animal not a cross. Just not sure what type yet.